If you need dental crowns in Pasadena, TX, visit the dentists at Pasadena Family Dentistry. We design and place white, custom crowns that look natural, feel terrific, and provide long-lasting protection. If you have a severely worn, badly decayed, or cracked tooth, a crown will restore the structural integrity you need to get you smiling again! Crowns completely cover teeth to restore shape and size. They provide a barrier against decay, and they safeguard a tooth from further injury. Dr. Holmes, Dr. Revel, and Dr. Lowry create all-white crowns that blend seamlessly with natural teeth. Made of fine dental porcelain, white crowns contain no dark metal to detract from your all-white smile. When you visit us for dental crowns in Pasadena, TX, we use a precise color-matching system to find the right shade of porcelain to blend with your natural tooth color. Porcelain crowns are also extremely durable, lasting between 5 and 15 years. The life span of a crown depends on the amount of wear and tear the crown is exposed to, as well as your oral hygiene practices and mouth-related habits. You should brush and floss twice a day to protect the base of your crown from bacterial growth and visit us twice a year for professional dental exams and cleanings. After getting dental crowns in Pasadena, TX, you should also avoid such habits as grinding, chewing ice, biting your fingernails, and using your teeth to open packaging. Typically, we can design, fit, and place your crowns in just a couple of short appointments. On your first visit, Dr. Holmes, Dr. Revel, or Dr. Lowry will prepare your tooth for the crown by removing some structure from the chewing surface and sides. 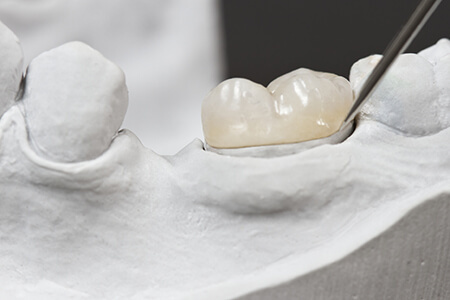 They will then create an impression of the reshaped tooth, as well as the adjacent teeth, to ensure that the crown won’t affect your bite. This impression is sent to the dental lab, where your custom permanent crown will be fabricated. A temporary crown will be placed over your tooth as protection while you wait. At your second visit for dental crowns in Pasadena, TX, Dr. Holmes, Dr. Revel, or Dr. Lowry will remove your temporary crown and check the new crown for fit and color before cementing it in place. Call Pasadena Family Dentistry to schedule your appointment for dental crowns in Pasadena, TX today.